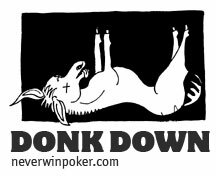 The relatively new DonkDown.com is pretty much the new NeverWinPoker forum, run by Bryan Micon and Todd Witteles. By run, we mean they’re responsible for the content on the forum. The actual programmers were working from a Lithanian company owned by Tony G, a lithuanian poker professional, who bought a piece of the gossip site a few years ago. Most people in the poker community thought NeverWinPoker was the most filthy, offensive, sexist and drug glorifying poker website out there. Fortunately, not everyone on the planet is identical to eachother, so if this is your cup of tea please continue reading. Eventually Bryan Micon and his American colleagues parted with their colleagues from Lithuania, who have since turned it into a fairly boring website full of ‘spam’ (promoting other sites they’ve created and many crappy online rooms). This however hasn’t stopped Bryan Micon and his crew, as they pretty much moved all the forum content to their new forum website, DonkDown. So if we are to believe Micon and co. the zombies from Lithuania killed NeverWinPoker, who in their turn have been blamed for the killing of poker babe Brandi Hawbaker. To be honest, we will never know the real reason for the Tony G ‘killing’ of the old NeverWinPoker forum, but does it really matter with the new DonkDown forum being online? We don’t think so and if you don’t eiter then check out this Not Suited For Work poker forum. Here is Bryan Micon telling us some more about the things you can find on DonkDown.